If you've ever packed a bag for an upcoming trip, you know that just like anything else, there's an art to it. And the art is worth learning, because you don't want to be stuck with too much or too little, and consequently, you want to have what you need at the right time. Social media is much the same way. You want to express who you are (brand), succinctly and in a balanced way. Here are some parallels I thought of recently, while in the middle of...what else? Packing. The right suitcase= the right social media platform. Choose carefully, as you want to make the best decision for the long-haul. Don't just go with what's popular, or what looked good in the store. You want practicality, with some flair as well. Mix and match = variety. You wouldn't pack a suitcase with ten of the same color shirts, or three of the same style shoes--you want to mix it up. Same with social media. Go for various types of content in your blog posts and social media updates, including videos, podcasts, screencasts, and infographics. Anticipate needs=have backup content. Just like you'd toss a rainjacket or extra pair of socks into your bag, write a few extra blog posts so you have them handy if your schedule gets busy, and take advantage of Buffer or Hootsuite for advance scheduling options. Organize your stuff=channel your thoughts. The more cohesive you are online, the stronger your brand and personality. 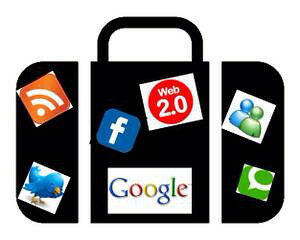 Just as you would fold your shirts or pack your accessories together, so can you organize your online presence. Publishing a blog series with a specific theme, tweeting keywords for your niche area, and sticking to your tagline and mission, are all ways of organizing your social brand. Pinterest is the latest online platform that reflects how you organize your thoughts and ideas, through pins and boards. Gifting = rewarding your community. You wouldn't travel hundreds of miles, only to show up empty handed on arrival. Learn the art of gifting your community, whether it's a free download, a discounted service or offer, or a unique promotion. Guard your valuables=don't give everything away. Know what your most valuable assets are, and release them sparingly. A great landing page will ensure that you receive important information about your community members that you can use for marketing and promotions later. So, that's my extended analogy, for now. What did I miss? Post here any observations you've had about how social media is like packing a suitcase!